Western Digital provides a flash storage solution that integrates with existing storage infrastructure. Flash storage reduces storage latency and enables faster access to large files, and improved performance for large databases and real time analytics workloads. 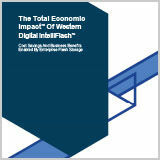 Western Digital commissioned Forrester Consulting to conduct a Total Economic Impact (TEI) study and examine the potential return on investment (ROI) enterprises may realize by deploying IntelliFlash Enterprise Flash Storage. The purpose of this study is to provide readers with a framework to evaluate the potential financial impact of IntelliFlash on their organizations. To better understand the benefits, costs, and risks associated with this investment, Forrester interviewed two customers with several years of experience using IntelliFlash.